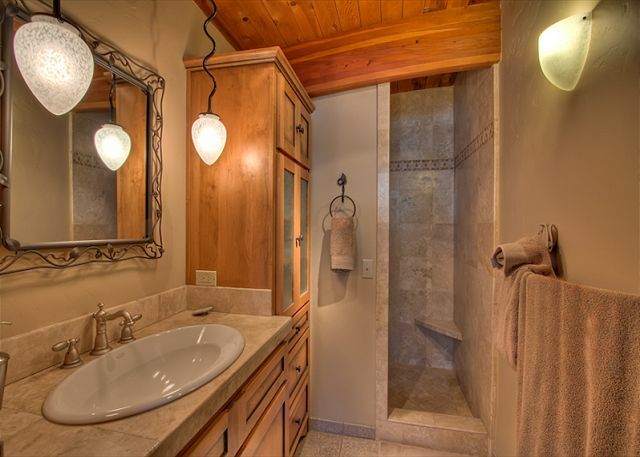 Truckee, CA United States - Robben 004 (FRI) | Donner Lake Realty, Inc.
Upstairs Master Bathroom with shower, toilet, sink. Queen Murphy bed, two futons. 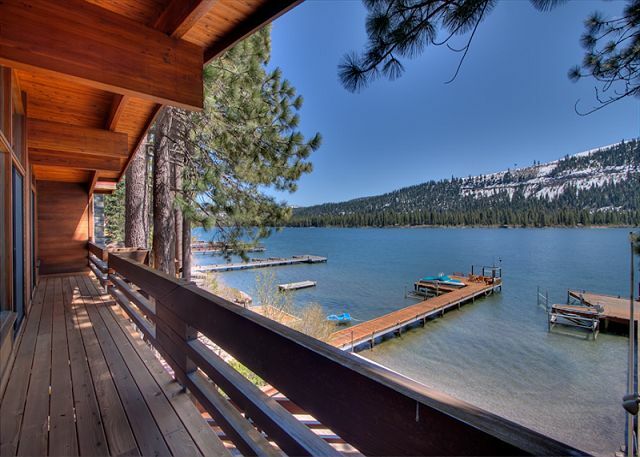 The Robben unit is a lakefront unit with private dock located on the North Shore of Donner Lake. 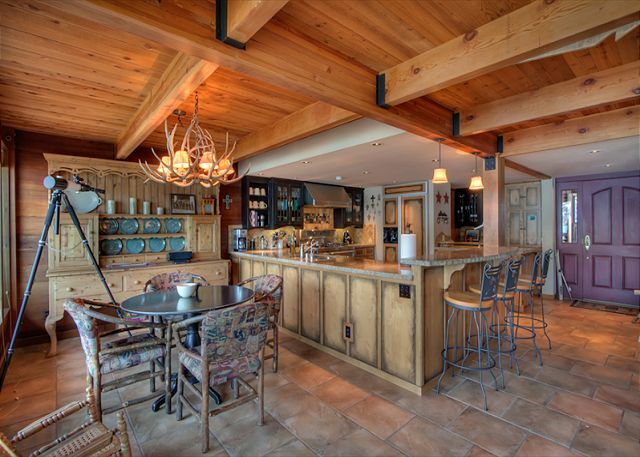 As you enter the home, the living room, dining room and kitchen make up one big great room. 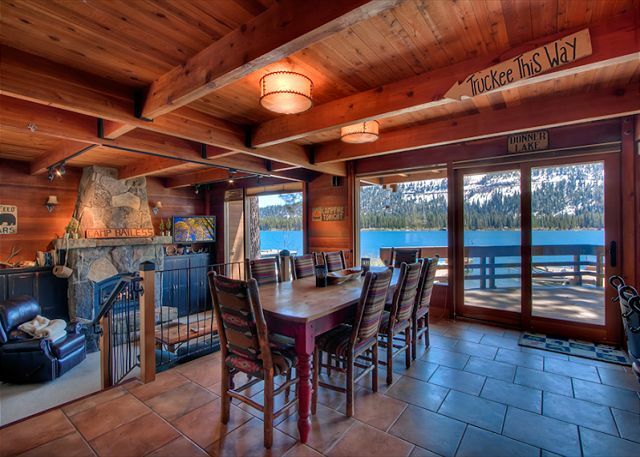 In the dining area is sliding glass doors that gives you access to the back deck. Connected to the kitchen is a .5 bathroom. 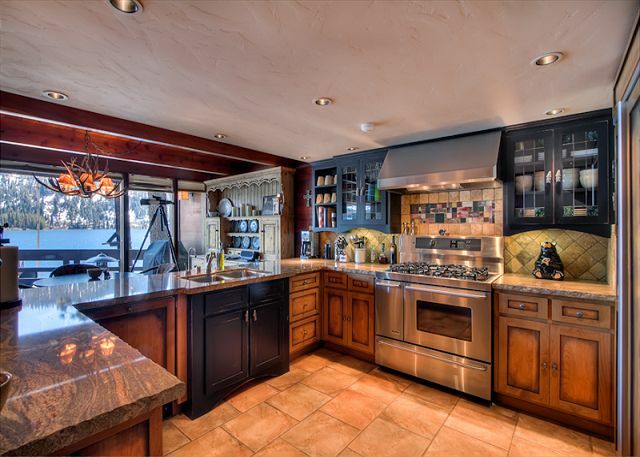 Also in the kitchen are stainless steel appliances, granite counter tops and tile floors. The dining area has a formal dining room table with seating for 8 as well as a smaller table with seating for 4. There is additional seating at the counter bar stool or enjoy the view from the breakfast nook. The living room has a gas fireplace, leather seating and HDTV Satellite TV. The stair case leads up to the three bedrooms or down to the game room. Upstairs you will find 3 bedrooms, and 2 bathrooms. There is a King bed in master with private bathroom. 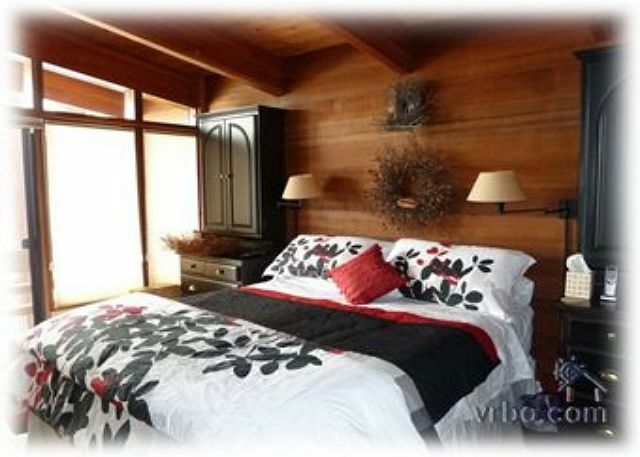 There is a queen bed in spare room, two twin beds in the second spare room. 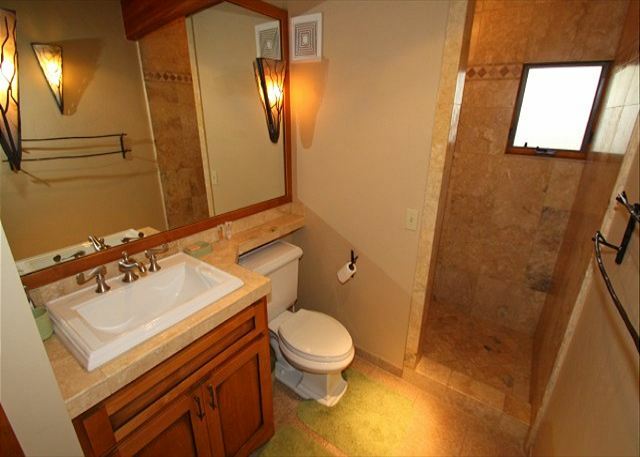 These two bedrooms share another bath located upstairs. 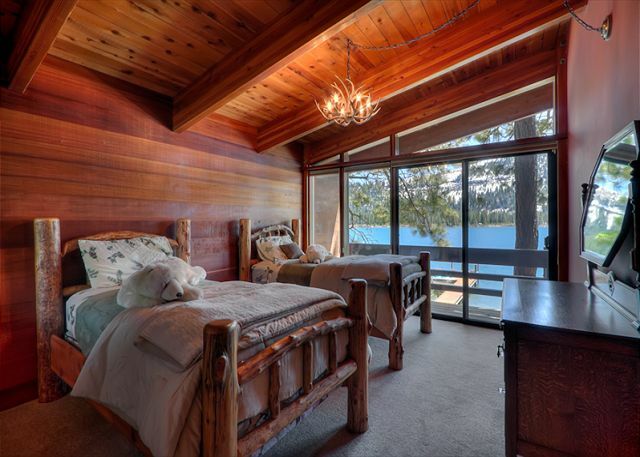 All three bedrooms have a sliding glass door that leads to a deck overlooking the lake. Downstairs is the den with a queen Murphy bed and two additional Double sized futon pads that are available for use in the den. 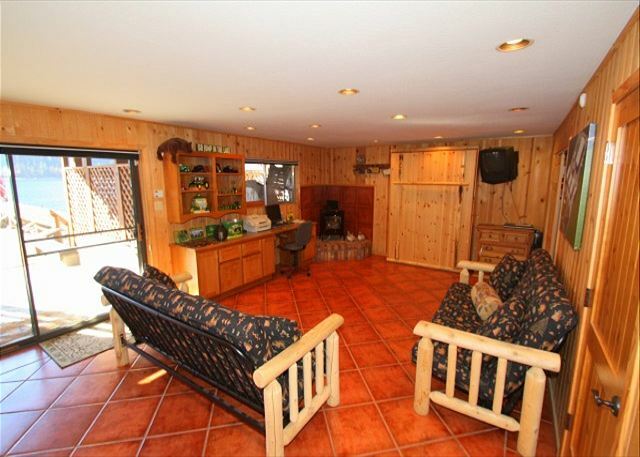 Also in the den there is a Sauna, private bath, and sliding glass door that leads out to the back patio area. The house sleeps 8 comfortably, but you can get a maximum occupancy of 12 if you use the 2 futons in the den. The house offers Dish network and WIFI available for renters use. Summer reservations require a 7 night minimum with a set check in and check out day of Friday. Our units do not have sheets, pillow cases, or towels included in the rental, guests are requested to bring their own. However, we do offer linen rental service with 72 hrs notice before arrival: sheets, pillow cases, and towels at a onetime fee of $10 per person. **Nightly Minimum Subject to Change for Holidays** 4 night minimum for Thanksgiving, 7 night minimum for Christmas/New Year's, 3 night minimum for Martin Luther Holiday Weekend, 3 night minimum for Presidents Holiday Weekend, 3 night minimum over the 4th of July, 3 night minimum for Labor Day holiday Weekend. Pet Free Home. Rooms Sleeps 12, King in Master, Queen in Spare, 2 singles in Spare, Queen Murphy & 2 Futons in Den. Sleeps 8 (12 MAX with Futons).